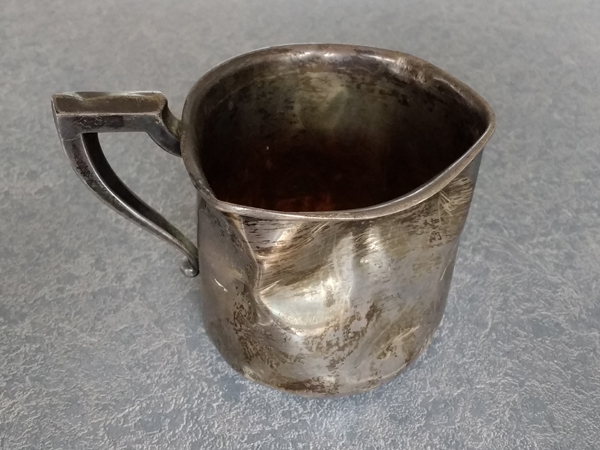 While this looks like an ordinary sterling baby cup the repair was a huge challenge. There was a gaping hole in the top edge where the original handle had ripped off taking part of the cup with it. It had also torn a hole in the side of the baby cup. Unfortunately, the customer had also lost the original handle for the baby cup. There are no replacement parts for baby cups. My first job was to construct a new sterling silver handle similar to what I imagined was there originally, but large enough to conceal the ripped hole on the outside. Before attaching the hew handle I rebuilt the rolled edge with sterling silver wire. Finally, I added an circular patch on the inside to conceal the hole repair making the cup water tight. You can't even tell that this cups was repaired. This sterling silver baby cup arrived very beat up, bent and misshapen. As a perfectionist, I would have loved to spend six to eight hours restoring this baby cup closer to its original form, but the customer only wanted to spend $300. Aligning my repair work to a limited budget, I focused on getting the baby cup shape back to a round-ish shape removing the worst dents and misshapen bottom. The bottom still isn't perfect, but I spend most of my time on the sides which are more visible. The machine engraving on the side was carefully preserved. There are no replacement parts for missing baby cup handles. The sterling silver baby cup on the right was missing a handle. At my suggestion the customer purchased the identical baby cup (with a damaged enamel interior) on e-bay. Because the blue enamel was damaged the baby cup did not cost much. I cut off the handle super carefully preserving the handle. The baby cup (left) provided a handle that matched the original lost handle. On the right you can see the fully restored sterling silver baby cup. This baby cup had extensive tarnish and sharp dings which are hard to remove. The baby cup appeared to have a satin finish with a polished edge so it was restored to its original finish. If you are a very observant person, you might have noticed that this sterling silver baby cup is the same style as shown in another side-by-side comparison on this page. Both are 20th century baby cups though from different customers. The options for sterling silver baby cups has steadily decreased in the 20th and 21st century. If you are looking for a sterling silver baby cup as a gift, buy a antique or vintage baby cup and have it repaired and polished. In general, the older the baby cup, the thicker the silver and more variety of designs. Polishing sterling silver baby cups and baby rattles is a wonderful way to keep cherished memories for future generations. The baby cups (left photo) had a gold plating on the inside that was only hand polished to preserve the gold plating. I am very careful to avoid polishing the engraving on the baby cups and baby rattles. Baby Rattles can be polished to rejuvenate their appearance. I have also taken out the dents in baby rattles but this is a major repair as they were not designed for dissassembly.